Now you can listen our song ‘Blackened Mind’ from YouTube! Lyrics available. Ten points in German Legacy Magazine! 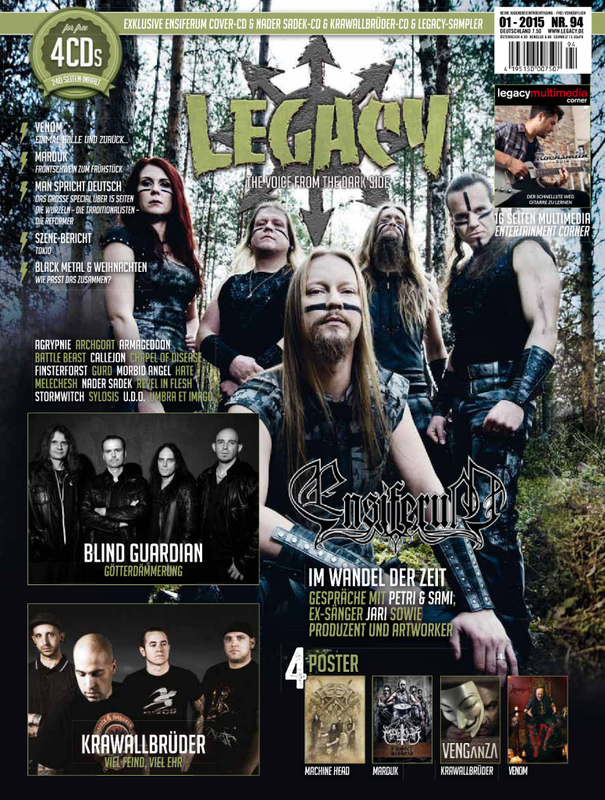 As the first update for the year 2015 we are proud to say that our album got ten points in German music magazine Legacy! We also ended up on the compilation cd which comes with the magazine in Europe with our track “My Charade” in it. You can read the reviews below in Finnish, English and German. tyyliin (Three Doors Down ym.) lisättynä raskaiden riffien oheen radioystävällisiä osioita, mutta ilman tylsyyttä. Kappaleissa on myös progressiivisia osia. Tyypillistä suomalaista, jouhevaa, kokeellista, aina vaan erikoisempaa ja yllättävän hyvää. Omakustannejulkaisuksi levy yllättää, nimenomaan laadun vuoksi – levytyssopimus olisi pitänyt syntyä jo ajat sitten! Laulaja Antti Jokiranta on laulullisesti täysin muotissaan, hän omaa tunnistettavanäänen laajalla skaalalla – joka tukee hyvin kappaleiden eri tunnetiloja vievän niitä hyvin eteenpäin. 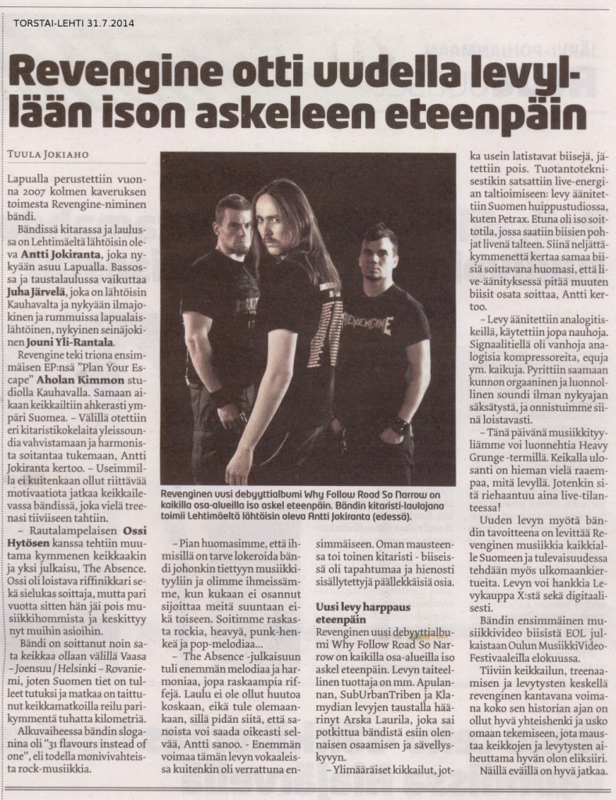 Omasta mielestäni heavymetalli-osuuksia saisi olla enemmän, mutta musiikillisesti levy on taideteos mistä ei muuttaisi mitään. Ilman kompurointia ja ilman teräviä kulmia nämä miehet leikkaavat silkkaa täydellisyyttä, joka myös heijastuu loistavasti piirrettyyn yksityiskohtaiseen kansitaiteeseen joka toimii parhaiten vinyylinäja varmasti myös näin digi-packina. Avomieliset lukijamme saisivat antaa näille suomalaisille mahdollisuuden kuuntelemalla levyn ja odottaa positiivisia yllätyksiä. 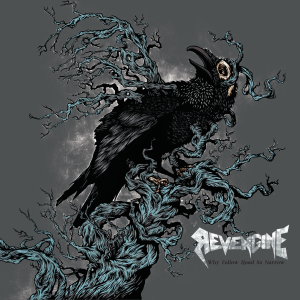 CD:tä myydään 12€ hintaan osoitteessa www.revengineband.com. 10 pistettä! REVENGINE comes from Finland. 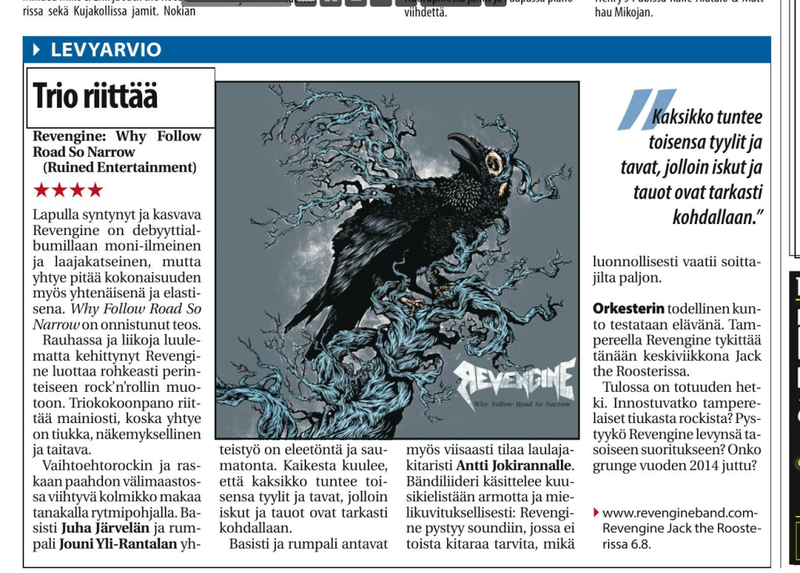 These finns deliver an adventure from balanced mixture of heavy rock, rock, pop and alternative to the listener. Allegedly, “Why Follow Road So Narrow” is REVENGINE’s debut album, but it sounds so professional, as if the musicians have been for many years in the business and have put a lot of work and money to the mix. The Finns are based significantly at the American line (Three Doors Down and Co)and build next to some heavy riffs many radio friendly sections but without any blunt. There are even progressive sections on the tracks. Typical finnish, smooth, always experimental, always something special and always surprisingly good. The “Why To Follow Road Narrow” as self-published release appears surprising, because the quality – actually a long time ago a recording contract should have been due! Frontman Antti Jokiranta is vocally perfectly cast and besides a voice with recognition also a very diverse scale, which the different moods of the pieces to fit can carry. For criticism from the perspective of small metallic share of real heavy riffs, musical, however, this slice a work of art in which there is nothing to suspend. Without stumbling but also without corners and edges, these finns slice pure perfectionism, which is also reflected in the wonderfully detailed and strong cover, which on vinyl or certainly in Digipack works best. Open-minded readers should give these rocking Finns a chance and wait for some positive surprises. 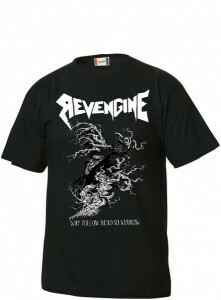 The CD is sold for 12, – EURat www.revengineband.com . (WHO) 10 points! Wiedererkennungswert auch ein sehr abwechslungsreiches Organ, welches die unterschiedlichen Stimmungen der Stücke passend zu transportieren vermag. Zu kritisieren ist aus metallischer Sicht der geringe Anteil an wirklichen heavy Riffs, musikalisch jedoch ist dieses Scheibchen ein Gesamtkunstwerk an dem es eigentlich nichts auszusetzen gibt. Ohne Patzer, aber auch ohne Ecken und Kanten ist dieses finnische Scheibchen Perfektionismus pur, was sich auch im wunderbar detaillierten und aus-drucksstarken Cover widerspiegelt, welches sicherlich auf Vinyl oder im Digipack am besten wirken würde. Etwas aufgeschlossenere Leser sollten diesen rockigen Finnen eine Chance geben, es warten so einige positive Überraschungen. Die CD kann für 12,- Euro auf www.revengineband.com erworben werden. (WHO) 10 Punkte! 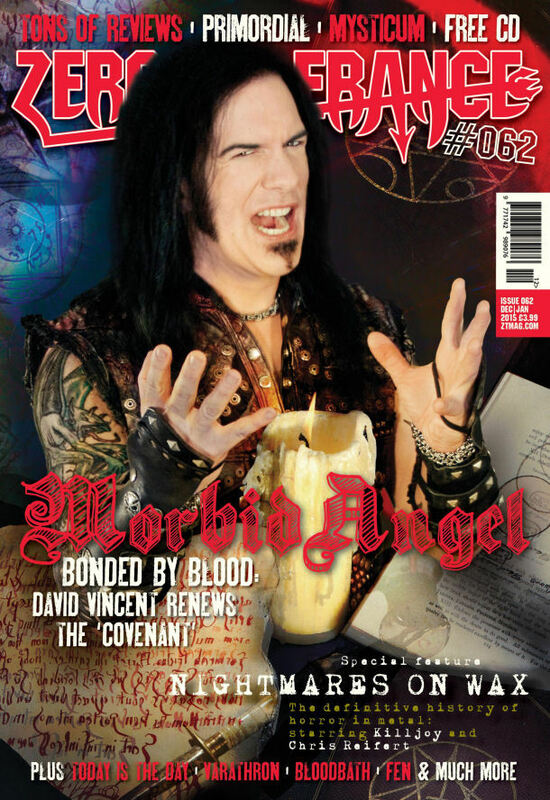 From this magazine cover mounted cd you can find fourteen pretty heavy tracks + our always so positive song ‘Paraside‘. Check the issue! Why Follow… praised as excellent in USA ! Read more from Metal Temple! ‘Very honorable record in the genre.’ – Revengine album was reviewed in French music magazine, Music Waves! 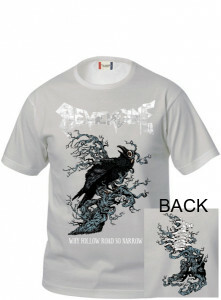 New T-Shirts available! Sale on earlier stuff!